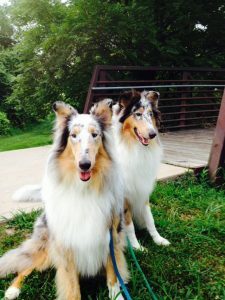 Cali and Skye Lind (Sandy) are three-year-old blue merle Collies who are making their stage debut in this production of Annie the Musical. Cali is a certified therapy dog; he is now training to work in crisis response. Skye is currently working on her therapy certification; she is also an accomplished dancer. Cali and Skye are trained by their owner, Dr. Vicki Lind, professor of music education at the University of Arkansas at Little Rock.